We have unparalleled experience in interpreting technical data and advising our customers on the best action for managing the condition of their thermal fluid. That’s why we’re the market leader. 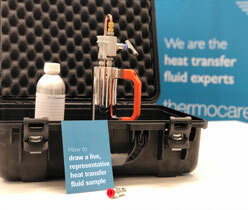 Reduce Costs Deterioration in your thermal fluid does not necessarily warrant instant replacement. There are a number of measures we can take to extend fluid life before it is classified as condemned, including filtration, light ends removal and thermal fluiddilution. Enjoy energy savings – carbon in your system will ensure you spend more on energy as carbon can’t be heated. Degraded oil in your system will draw more energy as your pumps work harder. * Average Capital Expenditure costs for replacement parts are £15,000* for a heater coil and £40,000* for a new heater based on 10,000 litres. This is in addition to the cost of draining the system, flushing the system and refilling it with a new charge of thermal fluid suitable for your application.